In the English-speaking world, Karl Renner is by far the best-known among the Austro-Marxists who were active in the Austrian socialist movement during the first few decades of the twentieth century. Recognition of Renner's scholarship is due largely to the English translations of his works on Marxism, as well as to the secondary writings on his notions of socialist legality and national cultural autonomy. Renner has for over half a century been celebrated for the only book of his that has, to date, been wholly translated into English. 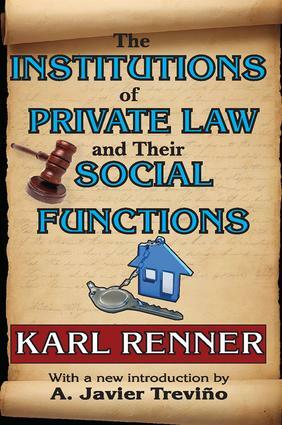 It remains the classic socialist attempt to off er a realistic understanding of the role of the legal institution of private property in modern society: The Institutions of Private Law and Their Social Functions. In his introduction to this edition, A. Javier Trevii?1/2o discusses the volume's relevance for today, and briefly describes that aspect of Renner's life that occupied most of this time and energy: his involvement in Austrian social democratic politics. The substance of Renner's exposition remains intact. The text provides one of the best insights into the relationship between capitalism and property's economic functions. It emphasizes how this fundamental institution's application has, since the initial stage of finance capitalism, increased or diminished, been externally transformed, or inherently metamorphosed. In an age of unprecedented global financial crisis, emerging market countries, and increased government regulation, Trevii?1/2o suggests we would do well to heed the book's message. It might help us understand the complex situations we encounter today as we grapple with our hybrid identities as salaried workers and economic investors. ByO. Kahn-Freund, L.L.M. Dr. jur.